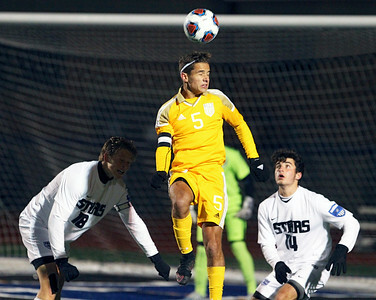 H. Rick Bamman - hbamman@shawmedia.com Jacobs' Daniel Buirge heads the ball over teammate John OConnor (right) and St. Charles North's Joshua Amaro in the IHSA Class 3A soccer super-sectional on Tuesday, Oct. 31, 2017 in St. Charles. North won, 2-0. 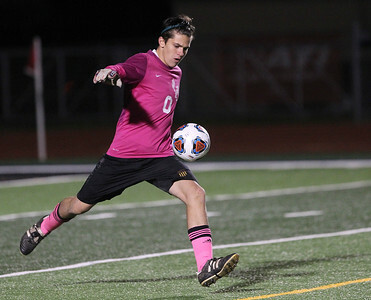 H. Rick Bamman - hbamman@shawmedia.com Jacobs keeper Preston Krahl clears the ball against Charles North in the IHSA Class 3A soccer super-sectional on Tuesday, Oct. 31, 2017 in St. Charles. North won, 2-0. H. Rick Bamman - hbamman@shawmedia.com Jacobs' Noah Melick makes a steal in front of St. Charles North's Connor Bettini in the IHSA Class 3A soccer super-sectional on Tuesday, Oct. 31, 2017 in St. Charles. North won, 2-0. H. Rick Bamman - hbamman@shawmedia.com Jacobs' Austin Snobel is consoled by St. Charles North's Hunter Denson after the Golden Eagles 2-0 loss in the IHSA Class 3A soccer super-sectional on Tuesday, Oct. 31, 2017 in St. Charles. 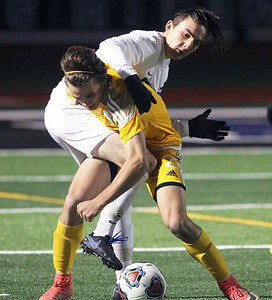 H. Rick Bamman - hbamman@shawmedia.com Jacobs' Gabriel Swarthout and St. Charles North's Jake Persenico get wrapped up while fighting for control of the ball in the IHSA Class 3A soccer super-sectional on Tuesday, Oct. 31, 2017 in St. Charles. North won, 2-0. 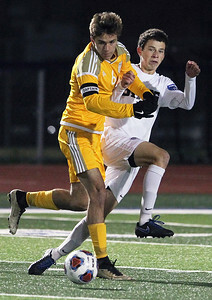 H. Rick Bamman - hbamman@shawmedia.com Jacobs's Colin Walsh heads the ball in front of St. Charles North's Kyle Kolodziej in the IHSA Class 3A soccer super-sectional on Tuesday, Oct. 31, 2017 in St. Charles. North won, 2-0. 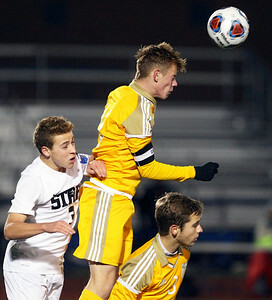 H. Rick Bamman - hbamman@shawmedia.com Jacobs' Colin Walsh heads the ball in front of St. Charles North defenders Kyle Kolodziej (left) and Parker Kolb in the IHSA Class 3A soccer super-sectional on Tuesday, Oct. 31, 2017 in St. Charles. North won, 2-0. 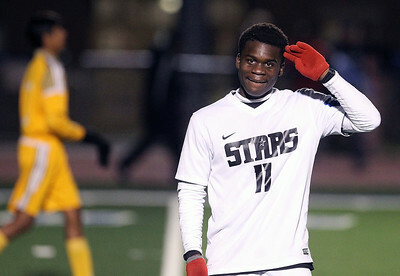 H. Rick Bamman - hbamman@shawmedia.com St. Charles North's Bernard Elegbede salutes the crowd after his goal in the IHSA Class 3A soccer super-sectional on Tuesday, Oct. 31, 2017 in St. Charles. North won, 2-0. 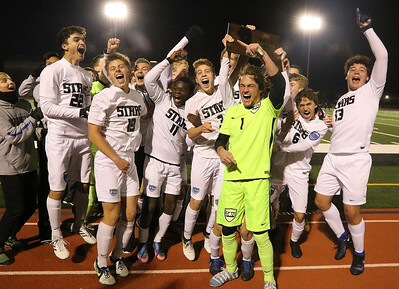 H. Rick Bamman - hbamman@shawmedia.com St. Charles North players celebrate their 2-0 win over Jacobs in the IHSA Class 3A soccer super-sectional on Tuesday, Oct. 31, 2017 in St. Charles. 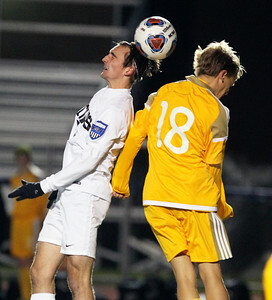 H. Rick Bamman - hbamman@shawmedia.com St. Charles North's Parker Kolb moves the ball past Jacobs' John OConnor in the IHSA Class 3A soccer super-sectional on Tuesday, Oct. 31, 2017 in St. Charles. North won, 2-0. 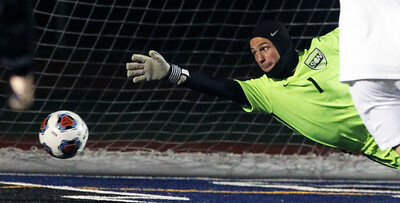 H. Rick Bamman - hbamman@shawmedia.com St. Charles North's keeper Piercarlo Ricossa makes a save against Jacobs in the IHSA Class 3A soccer super-sectional on Tuesday, Oct. 31, 2017 in St. Charles. North won, 2-0. H. Rick Bamman - hbamman@shawmedia.com St. Charles North's Jake Persenico (center) celebrates his goal with Connor Bettini (left) and Alex Somera in the IHSA Class 3A soccer super-sectional on Tuesday, Oct. 31, 2017 in St. Charles. North won, 2-0. 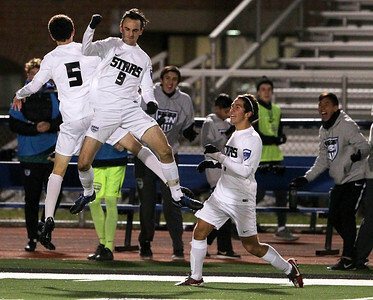 H. Rick Bamman - hbamman@shawmedia.com St. Charles North's Peter Willis celebrates with fans the North Stars' 2-0 win over Jacobs in the IHSA Class 3A soccer super-sectional on Tuesday, Oct. 31, 2017 in St. Charles. H. Rick Bamman - hbamman@shawmedia.com St. Charles North's Jake Persenico heads the ball past Jacobs' Liam Armstrong in the IHSA Class 3A soccer super-sectional on Tuesday, Oct. 31, 2017 in St. Charles. North won, 2-0. 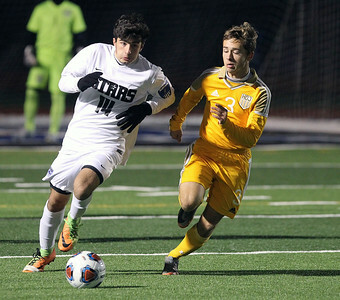 Parker Kolb in the IHSA Class 3A soccer super-sectional on Tuesday, Oct. 31, 2017 in St. Charles. North won, 2-0.